Sunday 19th September is the date for the Run for Dreams this year. We are looking at doing more in the West Park this year though with lots of things to entertain the youngsters too. 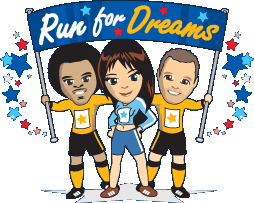 I know that we are hoping for a much bigger turn out this year and so I am hoping that many of you will sign up to join Steve Bull, Don Goodman and myself in this really important fundraising event for Promise Dreams. Good news for those of you that like a bit of a lie in on a Sunday – we’re starting later in the morning………………..Please join us! I’ve also got a new JustGiving page to help raise funds for promise dreams, please check it out.